"And then on Harry's birthday (which the Dursley had completely ignored) he had received four superb birthday cakes, one each from Ron, Hermione, Hagrid and Sirius. Harry still had two of them left, and so, looking forward to a real breakfast when he got back upstairs, he started eating his grapefruit without compliant." "Dobby now handed Harry a small package, which turned out to be- socks. The left sock was bright red, and had a pattern of broomsticks upon it; the right sock was green, with a pattern of Snitches." "Hermione had given Harry a book called Quidditch Teams of Britain and Ireland; Ron, a bulging bag of Dungbombs; Sirius, a handy penknife with attachments to unlock any lock and undo any knot; and Hagrid, a vast box of sweets including all Harry's favourites- Bertie Boot's Every Flavour Beans, Chocolate Frogs, Drooble's Best Blowing Gum and Fizzing Whizzbees. There was also, of course, Mrs Weasley's usual package, including a new jumper (green, with a picture of a dragon on it- Harry supposed Charlie had told her all about the Horntail) and a large quantity of home-made mince pies." "He could hardly bear to think of the pair of them having fun at The Burrow when he was stuck in Privet Drive. In fact, he was so angry with them he had thrown away, unopened, the two boxes of Honeydukes chocolates they'd sent him for his birthday. He'd regretted it later, after the wilted salad Aunt Petunia had provided for dinner that night." "Harry awoke on Christmas morning to find a stack of presents at the foot of his bed and Ron already halfway through opening his own, rather larger, pile. 'Good haul this year,' he informed Harry through a cloud of paper. 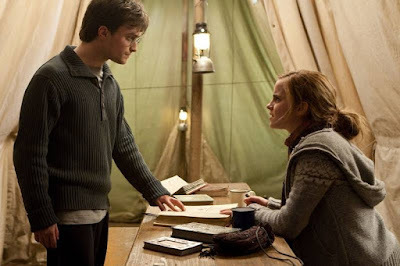 'Thanks for the Broom Compass, it's excellent; beats Hermione's- she got me a homework planner'"
"Harry sorted through his presents and found one with Hermione's handwriting on it. She had given him, too, a book that resembled a diary except that every time he opened a page it said aloud things like: 'Do it today or later you'll pay!'" "Sirius and Lupin had given Harry a set of excellent books entitled Practical Defensive Magic and its Use Against the Dark Arts, which had superb, moving colour illustrations of all the counter-jinxes and hexes it described. Harry flicked through the first volume eagerly; he could see it was going to be highly useful in his plans for the DA." "Hagrid had sent a furry brown wallet that had fangs, which were presumably supposed to be an anti-theft device, but unfortunately prevented Harry putting any money in without getting his fingers ripped off. " "Tonks's present was a small, working model of a Firebolt, which Harry watched fly around the room, wishing he still has his full-size version; Ron had given him an enormous box of Every-Flavour Beans, Mr and Mrs Weasley the usual hand-knitted jumper and some mince pies, and Dobby a truly dreadful painting that Harry suspected had been done by the elf himself. He had just turned it upside-down to see whether it looked better that way when, with a loud crack, Fred and George Apparated at the foot of his bed." "Harry's presents included a sweater with a large Golden Snitch worked on to the front, hand-knitted by Mrs Weasley, a large box of Weasleys' Wizard Wheezes products from the twins and a slightly damp, mouldy-smelling package which cam with a label reading: 'To Master, from Kreacher.'... A moment later, Harry had given a loud yell and leapt out of his camp bed; the package contained a large number of maggots." 'This isn't your average book,' said Ron. 'It's pure gold: Twelve Fail-Safe Ways to Charm Witches. Explains everything you need to know about girls. If only I'd had this last year, I'd have known exactly how to get rid of Lavender and I would've known how to get going with... well, Fred and George gave me a copy, and I've learned a lot. You'd be surprised, it's not all about wandwork, either." "When they arrived in the kitchen, they found a pile of presents waiting on the table, Bill and Monsieur Delacour were finishing their breakfast, while Mrs Weasley stood chatting to them over the frying pan... Harry sat down took the square parcel she had indicated and unwrapped it. Inside was a watch very like the one Mr and Mrs Weasley had given Ron for his seventeenth; it was gold, with stars circling round the face instead of hands. The rest of her speech was lost; Harry had got up and hugged her. He tried to put a lot of unsaid things into the hug and perhaps she understood them, because she patted his cheek clumsily when he released her, then waved her wand in a slightly random way, causing half a pack of bacon to flop out of the frying pan on to the floor." "'Happy birthday, Harry!' said Hermione, hurrying into the kitchen and adding her own present to the top of the pile. 'It's not much but I hope you like it. What did you get him?' she added to Ron, who seemed not to hear her. 'Come on, then, open Hermione's!' said Ron. She had bought him a new Sneakoscope." "The other packages contained an enchanted razor from Bill and Fleur (Ah yes, zis will give you ze smoothest shave you will ever 'ave,' Monsieur Delacour assured him, 'but you must tell it clearly what you want... ozzerwise you might find you 'ave a leetle less ahir zan you would like...'), chocolates from the Delacours and an enormous box of the latest Weasleys' Wizard Wheezes merchandise from Fred and George." ''S'nothing',' Said Hagrid, with a wave of a dustbin-lid-sized hand." "'"To Harry James Potter,"' he read, and Harry's insides contracted with a sudden excitement, '"I leave the Snitch he caught in his first Quidditch match at Hogwarts, as a reminder of the rewards of perseverance and skill."'" And then begins the tent life and no presents happen in the tent life. So there ya have it! Presents galore for Harry! It's fun seeing all the extra detail in what is considered a gift in the wizarding world, chocolate and cakes being one of the main presents; little jokes like the Twelve Fail-Safe Ways to Charm Witches book from Ron; fun gadgets like the mini Firebolt model and the enchanted razor; and the special magical gift for a wizard coming of age, the gold watch with stars. Harry gives some good gifts throughout the series too, but it would have been far too much to include them here too. If you haven't already, go and read part one of Harry's Presents, and it Harry based blog posts are what you're in to then Best Harry Potter Food and Feasts and Harry Potter Ice Cream Moments should be right up your street. Now if you'll excuse me, I think I'll probably spend the rest of the day reading the Deathly Hallows.